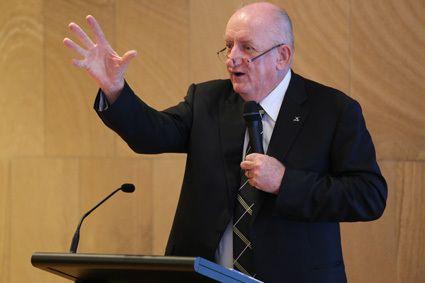 Tim Fischer speaking at the Francis Rush Centre, Brisbane, for the launch of his new book "Holy See Unholy Me". TIM Fischer has given a measured response to the thorny question of the comparative diplomatic skills of Prime Minister Kevin Rudd and opposition leader Tony Abbott. Australia’s former Deputy Prime Minister and ex-Ambassador to the Holy See was in Brisbane last week to launch his latest book Holy See, Unholy Me. Prompting the question was Mr Fischer’s obvious respect in his new book for Mr Rudd’s expertise in the field of foreign affairs. It was Mr Rudd who, in July 2008, had phoned the ex-Nationals leader to invite him to be Australia’s first resident ambassador for Australia to the Holy See. However, the experienced diplomat had a ready answer for such a question in the shadow of a federal election. “Both men are practising Christians,” he said. Mr Fischer was in Brisbane on Thursday, August 29 for two events related to Holy See, Unholy Me. First was a talk at Brisbane archdiocese’s Assembly of Catholic Professionals luncheon at the Stamford Plaza. Mr Fischer then attended the launch of his book by Archbishop of Brisbane Mark Coleridge in the Francis Rush Centre. Mr Fischer spoke of the “great privilege” of working as Australia’s first resident ambassador to the Holy See, of the contributions he was able to make while there, of the impact of Mary MacKillop’s canonisation on his own faith journey and the timing of Pope Benedict’s resignation. Mr Fischer also once more revealed his legendary love of trains with his story of the Caritas Express, the subject of a fascinating chapter in his book. He said he has great appreciation of the grandeur of his surroundings at the Vatican. He said his experiences as a parishioner of the Caravita parish had equal significance. “The simplicity and community of worship were wonderful,” he said. “It was terrific to have Mass in the round. Mr Fischer said among contributions he was able to make during his posting were the hosting of a food security conference and his work as envoy to the newly formed country of South Sudan and other countries like Eritrea and Bhutan. “On a lighter note, I very much enjoyed organising the Caritas Express with friends to raise about $20,000 for victims of earthquakes in Haiti,” he said. “It was the first steam train this century to depart from the Pope’s own platform and travelled to Orvieto, north of Rome. His involvement in the organisation of Mary MacKillop’s canonisation in Rome in 2010 was another highlight. “I was very moved by the event,” he said. Mr Fischer said he had predicted Pope Benedict’s resignation based on portents including the Pope’s two visits to the tomb of Pope Celestine V. The pope and later saint resigned the papacy in 1294 in Naples. “I got the year wrong as I thought would be 2014,” he said. Mr Fischer said he was unlikely to take up a similar role in future. He is donating money raised from the sale of Holy See, Unholy Me to several charities including the Anglican Centre in Rome and the Mary MacKillop Foundation.